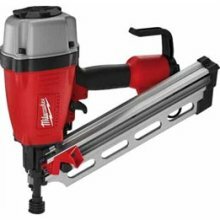 Milwaukee 7110-20 framing nailer, my favorite new toy! Bought this in 2006 and today is the first day I'm using this! I was a little scared at first, having flashes of nail projectiles flying thru the air and piercing my hubby. But I tried it on a waste piece and didn’t kick like I thought it would. I love this thing! I don’t know why I didn’t try to use it earlier. Now my mind is racing thinking of all the stuff I can build!